It started raining just as soon as we got in our tents last night. It felt kind of cozy until 3:30 when my feet were soaking wet. I had neglected to tuck the ground plastic under the corner of the tent. Well, needless to say, it was a pretty long night. It drizzled all night and we decided we deserved a Mc D's breakfast. So we packed up the wet stuff and hit the road. The Newport Aquarium is supposedly the best in the Northwest, so we checked it out. It is very nice. Not real large, but all the exhibits are very neatly done. We enjoyed the sea turtle and sea otters the most. On our way down to Florence, we ate lunch at a great overlook of the central coast. 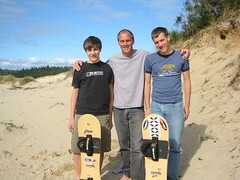 When we got to the dunes we had to try sandboarding. We rented a couple of boards for twenty-four hours and tried them out at Honeymen Park. We rented a room at a respectable 'dumpy trumpy' that has a pool and wireless internet. We figured we deserved it after two nights of cold wet camping. For supper, the boys had Taco Bell take-out and Esther and I went out for seafood. I remember past discussions related to the Bulthuis spirit of adventure but I had no idea the extent of it. It is really cool seeing all the stuff your family does, what a zest for life! Your blog is really interesting too. I am enjoying reading it. Once Peggy reads this one she will want to award Esther a medal.